﻿ Board of Directors - Dr. Nik & Associates Sdn. Bhd. Dato’ Ir. Dr. Nik Mohd Kamel Nik Hassan is the founder and Managing Director of Dr. Nik & Associates Sdn. Bhd. (DNA) - an engineering and project management consultancy firm. Dato’ Dr. Nik had initially started Dr. Nik & Associates as a sole proprietor in 1993 and later in 1994 the company has been incorporated as Dr. Nik & Assocates Sdn. Bhd. Under his leadership, guidance and initiatives over the 20 years since its inception, the company has grown and expanded from its base and headquarters in Wangsa Maju, Kuala Lumpur, with strategic branches opened throughout Malaysia. On its own and through its associate companies, DNA has been involved in numerous engineering consultancy and management projects in Malaysia and also overseas. With an organization comprising of more than 100 experienced professionals and supporting staff, it is now one of the country’s leading and most respected firms, with a hard-earned and proven track record for reliability and credibility. Dato’ Dr. Nik, who was born in 1953, had obtained his first professional qualification in Civil Engineering from the University of Southampton, England in 1976. This was followed by a B.Sc. (Hons) and then M.Sc. (Hons) in Civil Engineering in 1979 and 1981 respectively from the same university. In 1985, he obtained his Ph.D. in Hydraulics Engineering from University of Manchester’s Institute of Science and Technology, United Kingdom. Dato’ Dr. Nik had started his working life in academia, rising to later become an Associate Professor at the Civil Engineering Department of the University of Malaya (UM). He was also the Referee for the Institution of Engineers Malaysia’s (IEM) Journal and Bulletin from 1987 to 1991, and the Director of UM’s Unit Perundingan in 1992. After 14 years of involvement in the academic side of engineering as a student and then tutor, lecturer and professor, Dato’ Dr. Nik decided to venture out and apply the skills and knowledge he had learned and taught to the practical world of engineering. From 1993 onwards, he has directed and also provided technical advice and input for all water resources and coastal engineering projects undertaken by DNA. These covered detailed designs of flood mitigation, river modelling, hydrological analysis, urban drainage design, water resources management, environmental impact assessment, coastal engineering design and modelling, dredging and land reclamation projects. The company’s clients over the years include government and semi-government agencies like the Department of Irrigation and Drainage (JPS), Public Works Department (JKR), Iskandar Regional Development Authority (IRDA) and Penang Port; and corporations like Petronas, Malakoff, E&O, UEM Construction and Siemens KWU. Dato’ Dr. Nik is also a Professional Member of the Board of Engineers Malaysia (BEM), a registered Environmental Consultant and Subject Specialist with the Department of Environment (DOE) Malaysia, a member of the International Association of Hydraulics Research (MIAHR), International Water Resources Association (MIWRA), Institution of Engineers Malaysia (MIEM) and the Malaysia Water Association (MWA). Dato’ Dr. Nik has also been appointed as an Advisor and Academic Panel for Universiti Teknologi Petronas (UTP), Universiti Teknologi Malaysia (UTM), Universiti Pertanian Malaysia (UPM) and Universiti Tun Hussin Onn Malaysia (UTHM). Dato' Sri Ir. 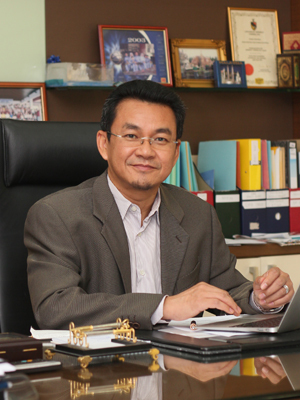 Suhaizan bin Wahid, who was born in 1963, is currently the Executive Director of Dr. Nik & Associates Sdn. Bhd. (DNA). He was a Civil Engineering graduate from the University of Adelaide in Australia and has more than 28 years of experience in extensive engineering projects. Dato' Sri Ir. Suhaizan had started his career with the Public Works Department (JKR) in 1985 and was involved in the planning, managing and supervision of various road, building, school and port projects throughout the country. He was the JKR Port Dickson District Engineer prior to joining DNA in 1996. Over the years since then, as Project Manager/Senior Structural Engineer, Dato' Sri Ir. Suhaizan was responsible for the structural components and management of numerous projects that were successfully undertaken by DNA. These projects include the Development of the Port of Tanjung Pelepas, the Petrochemical Jetty at Tanjung Langsat Port, Coastal Protection Works at Pantai Sabak in Kelantan, Construction of MAWILLA III Naval Base in Langkawi and in the designing of various roads and carriageways in Kedah, Perak, Selangor and Negeri Sembilan. 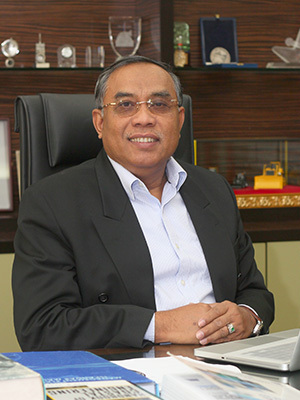 Dato' Sri Ir. Suhaizan is actively involved in all of DNA's projects and in the company's day-to-day activities. Dato’ Sri Ir. Suhaizan has been recognized as expert in port and harbour where he has contributed his ideas in various local and international seminars and conferences such as in Australia, Singapore, Japan and Indonesia. Dato’ Sri Ir. Suhaizan on his personal capacities has also engaged in social works where he has contributed consultancy and assistance to various states in construction of mosques, orphanage homes, public hall and others. In 2013, he was conferred Darjah Kebesaran Sultan Ahmad Shah, Pahang Yang Amat Di Mulia (SSAP).